However, lipid-polymer membrane artificial cells by themselves do not show any selectivity between sodium and rubidium (Fig. 11.7a, 11.7b). 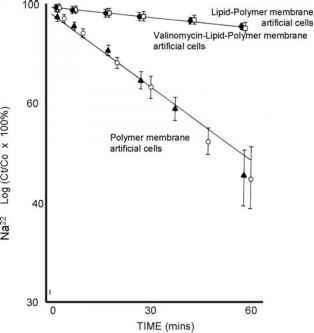 We incorporated valinomycin in the lipid-polymer membrane by exposing them to valinomycin at a concentration of 5 x 10_6M. Fig. 11.7a. The effect of lipid and valinomycin on the time-course of decrease in Na+ concentrations in the aqueous suspending medium. Co — original concentration; Ct — concentration at time (t). Mean and S.D. based on 4-12 experiments. This results in selectivity so that the rubidium influx is enhanced but the sodium influx remains unchanged (Fig. 11.7a, 11.7b) (Rosenthal and Chang, 1971, 1980). Thus, the permeability coefficients of lipid-polymer membrane artificial cells to rubidium is 1.45 ± SD 0.56 x 10"6 cm/sec. Valinomycin at a concentration of 5 x 10_6M significantly increases this to 4.91 ± 1.6 x 10 6 cm/sec. However, valinomycin has no effect on the sodium influx and it remains unchanged at 3.8 ± 0.3 x 10"6 cm/sec. Fig. 11.7b. The effect of lipid and valinomycin on the time-course of decrease in Rb+ concentrations in the aqueous suspending medium. Co — original concentration; Ct — concentration at time (t). Mean and S.D. based on 4-12 experiments. Bayley (1999) showed that only a bundle of a-helices or nanotubular f3-strands is needed to carry out the function. They can retain their function even when most of the protein portion is removed from the complex protein structure. 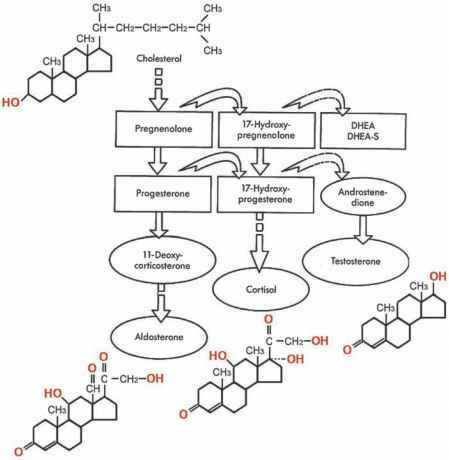 This means that researchers can design synthetic channels or redesign natural channels by changing the amino acid sequence and helix orientation. One of the simplest form is a neutral peptide, Ac-(Leu-Ser-Ser-Leu-Leu-Ser-Leu)3CONH2, that can function as a voltage-gated channel. Cyclic peptides can form hollow cylindrical nanotubules with possible variations in the lumen of the channel to allow for transport of different types of solutes based on size (Hartgerink J. D. et al., 1998). 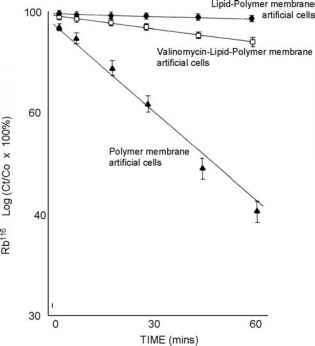 In the case of lipid membrane artificial cells, lipid vesicles, exposure to a-hemolysin or its genetically engineered mutants can increase the permeability to large single stranded nucleic acid (Bayley,1997). This is an example of how progress in molecular biology can be applied to artificial cells. The large amount of work being carried out by molecular biologists can be tapped for formation on different types of channels in artificial cell membranes.